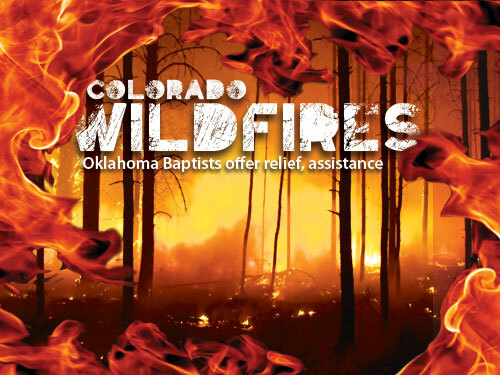 COLORADO SPRINGS, Colo.—Bill Winter, acting state disaster relief director for the Colorado Baptist General Convention, responded immediately when asked how valuable Oklahoma Baptists’ partnership with his state convention was proving to be as his team of disaster relief volunteers began to ramp up their ministry to those affected by wildfires raging across the Centennial State. “We could not have done it without them, plain and simple,” Winter asserted. “We have the capability of some small stuff; we have done it in the past, but not this big. For example, we had a request for a laundry trailer. Well, we don’t have one in Colorado. Oklahoma stepped up and brought their unit out here. “People were so thankful in the Ft. Collins area. The evacuees ran up with what they could grab out of their closets, and some of them had been living in those clothes for a week. They were just so thankful and so grateful for our Oklahoma partners who were there doing laundry. “We didn’t have that capability here in Colorado. “(As far as) setting up a kitchen, yes we can do that, but we can’t man it on a long term basis. We can run it for a short term. But we’re going to need Oklahoma people to come in and help. “Also we didn’t have on site a shower trailer; it was deployed on another location, and even Oklahoma helped us re-furbish that shower trailer. So, again, if it wasn’t for Oklahoma, we would not have had that shower trailer operational. Winter, who also is pastor of care and crisis ministries at Denver, Riverside, knows the effort to help Colorado residents recover from the ravages of the blazes will be a long one. As he spoke, Winter glanced at Oklahoma disaster relief director Sam Porter, and then spoke of how valuable Porter’s 14 years of experience had meant as the Colorado DR team had organized their response. “In my case as acting state director—I’ve never done this before—I’m overwhelmed. I was just supposed to be the guy who handled phone calls for two weeks. That was what I committed to, but suddenly this started happening and those phone calls started coming hot and heavy. “I was running down pretty fast. After the first week of doing that, I was released from my pastoral responsibilities by my church for two weeks to devote all of my energies to this. Colorado volunteer Ruby Rieves, a member at Denver, Riverside, came to Colorado Springs after working a week in Loveland helping with the Oklahoma laundry trailer set up at the Laramie County Fairgrounds. Asked if the laundry meant a lot to the evacuees, Rieves smiled, “Cleanliness is next to godliness. If you have been in the same clothes for three days, you feel dirty all over. It was really a blessing to those people. They were very appreciative, and they opened up with their stories, too. As always, meeting the physical needs of people after a disaster opens the door to share the Gospel. Rieves emerged from her experience as a fan of Oklahoma Baptists.